What about whistleblowers? And why the big Obama turnaround on state secrets? The Director of National Intelligence this week announced a new policy designed to discourage the leaking of classified information to journalists. Under the policy, employees who are subject to polygraph tests will be asked about communications with journalists, and agencies will step up administrative penalties for leaks. Unfortunately, the policy makes no distinction between employees who improperly disclose sensitive national security information and those who blow the whistle on illegal government activity. This failure is particularly problematic given that intelligence community employees are largely excluded from existing legal protections for whistleblowing and the Obama administration has brought more prosecutions against national security whistleblowers than all previous administrations combined. On a more positive note, a bipartisan group of members of Congress in the House last week introduced the State Secrets Protection Act, a bill that would make it harder for the executive branch to abuse the “state secrets privilege” in lawsuits alleging government misconduct. Under the Bush and Obama administrations, the government has persuaded judges to dismiss entire cases – including cases that challenge torture and warrantless wiretapping – on the grounds that going forward with the lawsuits would require the disclosure of evidence that could harm national security. The bill sensibly requires judges to evaluate claims of privilege based on the specific evidence that would be introduced, and would go much further than the administrative policy issued by the Justice Department in 2009. Q. Does the DNI’s policy include any protections or exceptions for whistleblowers – i.e., those who are disclosing waste, fraud, abuse, or illegal conduct? Does the policy differentiate between whistleblowing and malicious/negligent leaking in any way? Q. 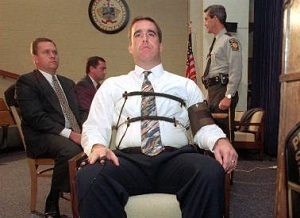 Given that the Obama administration has brought an unprecedented number of criminal prosecutions against government employees and contractors for allegedly leaking classified information to the press, will employees who are subject to the new polygraph requirements be informed that their answers may subject them to criminal prosecution? Will they be permitted to plead the Fifth Amendment, and if so, how will those pleas be treated? Q. Does the administration support the Whistleblower Protection Enhancement Act (WPEA) that was passed out of the Senate in May of this year? Would applying the DNI’s new policy to whistleblowers be consistent with the WPEA if it were enacted? Q. Experts agree that far too much government information is classified. As a result, journalists must routinely rely on leaks of classified information to engage in even the most rudimentary national security reporting. Does this new policy threaten to choke off public access to basic information about our government’s national security policies? Q. The State Secrets Protection Act has been reintroduced in each Congress since its original introduction in 2008. Why has the Obama administration not supported its passage? Q. Under the Justice Department’s 2009 policy on the state secrets privilege, if a lawsuit is dismissed on state secrets grounds, the Justice Department must refer any credible allegations to the relevant agency’s inspector general for investigation to ensure that there is some forum for accountability. Several major lawsuits (including three cases involving the practice of “extraordinary rendition”) have been dismissed on state secrets grounds since then. Has the Justice Department made any inspector general referrals? Q. In the Supreme Court case that established the modern state secrets privilege, United States v. Reynolds, the government invoked the privilege to shield an accident report that was revealed decades later to contain proof of the government’s negligence, not actual state secrets. The State Secrets Protection Act would prevent such abuses by requiring judges to examine, in closed chambers if necessary, each piece of evidence or proposed testimony over which the government claims privilege. Does the Obama administration support such a rule, and would it be willing to supplement the Justice Department’s 2009 policy to include it? Obama is controlled by the elite. He talks a good game on whistle blowing and personal freedom but he is no different than any right wing repubican when it comes to corporate privacy or personal freedom for the People. Just look at how the bankers are protected. I knew when GWBush opened Pandora's Box letting out the crushing of personal freedoms in the name of National Security that Presidents afterward would run with it as much as they abhor it in speeches.